Center It V block assists in drilling holes in tubing and pipe. It is specifically designed for use in a drill press. 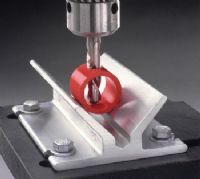 The V-block bolts to the table and the angled flats hold the material firmly in place so holes can be drilled without center-punching.